I made this layout for Scrapbook Daisies using the new "On the Sunny Side" collection from My Minds Eye. 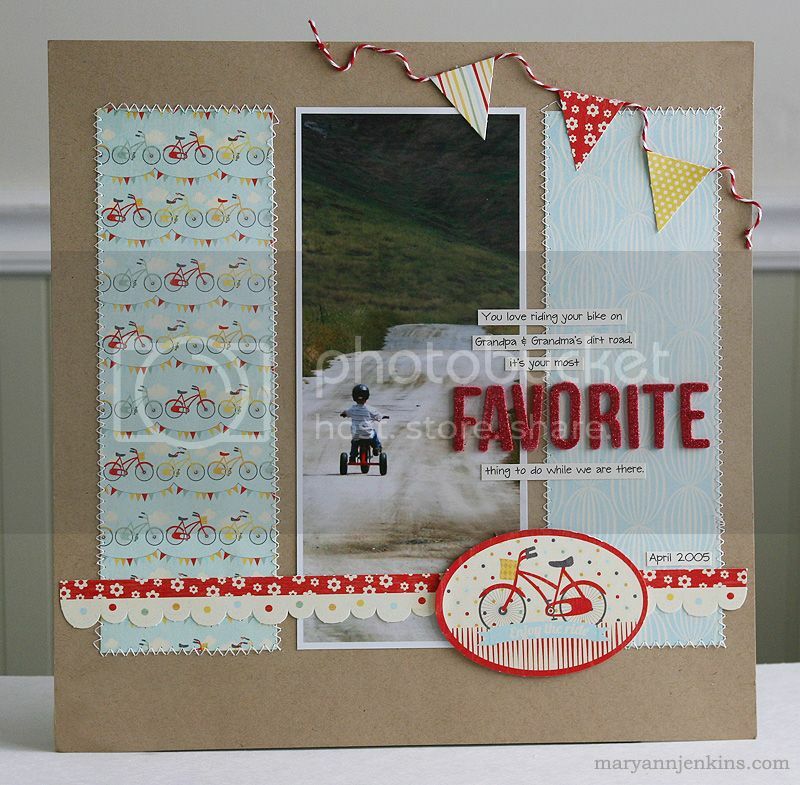 Don't you just love the cute bicycle print paper with the sweet little banners! We are in full Summer mode for our first week of no school, and I must say I am loving the getting up late as much as I am staying up late! We have a lot of things planned for these next 2 months, and I am so ready to relax and enjoy it all! I like how you used the twine in the banner. Very cute! I love this line! Just got mine and have been putting it to good use! I love the long photos and strips of paper. Gorgeous and so my style with the block design. Love the colors and large photo. When I am back on my home computer I need to pin this to Pinterest! This is just to cute! I love the stitching you did. It makes the entire layout come together so well. I love that line of paper and adore that layout. I really love the tall, thin photo. It really shows great perspective. Cute. I've not seen this new line yet... not in person. I love the colours. I love the simplicity of this - so cute!! I love this layout! Such a great design! I love the banner and the bicycles! Great LO! That photo is oh so cute and LOVE those papers! Great photo- I like how you designed this layout! Very nice layout Mary Ann. You have the scrapping thing down. Thanks for visiting my blog and commenting. I really appreciate it. I"m an American living in Ukraine where I teach scrapbooking but on a simpler level. I"m following you now. Hope you'll follow on my blog too.